Finally, after months of training, it was here. The Tower of Terror 10 Miler. My stomach was doing somersaults – nerves and excitement and some more nerves. Mr PugRunner and K were going to drop A and me off at Wide World of Sports to catch the shuttle to the staging area for the race. At 6:45, we were dressed and ready to go. I had my phone, my iPod, a bottle of water, and a little bag of Honey Stingers, Immodium and a banana. The coach shuttle let us off in the Hollywood Studios parking lot at around 7:30 PM, which was flooded with people. A DJ was playing dance music, people were checking in their bags, and runners were roaming around, taking pictures and grabbing last minute snacks and drinks. We headed to the port-a-potties (and I would like to point out that I have never, in my life, seen so many) and then started to search out some of my friends. I was jittery, and A pointed out that we were probably going to be waiting longer than we would be running. This made me laugh and relax, simply because it was so ridiculously true. We found my girlfriends (six of them who had driven down together and were making a girls’ weekend of it), and hung out with them, chatting and stretching and passing time. We still had some time to kill, so I sent out a text and found Rachel, from Undercover Diva: A Sitcom. We’ve been reading each other’s blogs for a while, and being at the same race was a fabulous reason to meet in person. She is every bit as sweet in real life as she is online, and I was so happy to get to say hi and chat for a few minutes. Hopefully, we’ll run into each other again. I ate my banana, hit the port-a-potty one more time, and at 9:15 AM, it was time to move into our corrals. A was up in D, the rest of the ladies were scattered in other corrals, and I was in H. At first, it was kind of lonely. It was crowded, and people seemed coupled and grouped up and not interested in making idle chit chat. Fair enough, it was getting late and hot and I’m sure we were all getting our race faces on. But then, I got word that a dear friend, the lovely Miss Ashley from Fiddle Dee Me, had just made her way into H, and was coming up. Ash had been under the weather and I had my fingers crossed that she would be there at the start line. She made it and I was so happy to see her! As we were chatting, the corrals started moving. We could see A open up and start walking towards, the finish line, followed closely by B and so on. It was the most massive herd of people, but it was orderly and everyone remained nice and calm within their sections. I was pretty impressed by that. As we waited, we could listen to the announcers over the huge speakers, as well as some great music. The emcees made sure to mention the heat advisory and made the request that people please take it easy and be respectful of the temperature and humidity. To me, it wasn’t really that hot, but it was definitely humid, and that was going to play a factor. I had finished my water about an hour ago, but I took a Honey Stinger to get a little energy in me before we headed out. After a beautiful rendition of the National Anthem, it was time. The first corrals went off with cheers and bursts of fireworks. It was absolutely overwhelming. So many people, so much enthusiasm, so many miles to run. At 10:20 PM, the announcers called for Corral H. The Twilight Zone theme music started, the fireworks bloomed in the night sky, and we were off. Ashley and I planned to get out of the opening crush together and then she would re-evaluate how she was feeling. I would have loved to run with her for the amazing company, but it wasn’t to be this time (See what I did there? We’ll do it one of these days!). After saying goodbye, I maneuvered my way around the rest of the crowd and fell into my pace. After we ran through the toll booths at Hollywood Studios, we headed up the clover leaf ramp (steeply banked, so the thought process was to get to the very top or very bottom and run on the grass if possible). Then it was down Osceola Parkway to Animal Kingdom, into the parking lot and back out to run in the opposite direction on Osceola. This comprised about half the race distance. I never even bothered plugging in my iPod. Along the median were speakers, stages and photo opps. I saw the witch from Snow White, Shadow Man from Princess and the Frog, Jack Skellington and Sally, among others. I think there were seven or eight in total. None of the lines seemed ridiculously wrong, but once I was running and in a groove, I kind of didn’t want to stop. Also, as I was headed away from Animal Kingdom, I saw a sight ten times more terrifying than the Grave Diggers who appeared later: The Balloon Ladies (They are the two lovely volunteers who carry balloons and walk every runDisney event at a 16 minute mile pace. If they pass you, it means you’re about to be swept). Gasp. I had a pretty big lead on them (they were across the median and at least two miles behind me), but still. Seeing them made me extremely motivated not to mess around. I tucked down and ran. The Osceola Parkway stretch ended by taking a right at a well-stocked (and busy) medical aid station, and into a dimly lit gravel pathway through the woods. I had heard rumors that this path became a rolling roadblock, as people slowed to a walk to watch their footing. Somehow, everyone on the four-person-wide strip kept up appearance of running, and I never really got stuck behind anyone. The gravel was slippery but I held my footing and then we were out in the Wide World of Sports complex. We followed a sidewalk towards the track, and I spotted a restroom building to my right. I had turned down the port-a-potties on the median by virtue of the fact that they were dark and in deep grass, but I did have to go to the bathroom. I was fairly certain that I wouldn’t have a chance like this on the course again, so I looped back and got on line. Fortunately, it wasn’t a super long wait, and I think I only lost about eight minutes. A slight bummer, but better than the alternative. Leaving the track put me at about the six-mile mark, and then it was on to the baseball field. There were some sharp turns and little inclines getting in and out, and then we were running on the sand around the bases. Spectators filled the lower seats, cheering us on with signs and words of encouragement. It was really nice. Once out of the baseball diamond, we ran through more of the complex, through the parking lot and back on to the main road. I started texting Mr PugRunner that I was at mile eight. He had tracking for my 5K and 10K splits, but I wanted to give him a heads up that I was coming. Eventually. I skipped the first two water stops, and then walked through the remaining ones, taking a few sips of PowerAde at each one. I wasn’t necessarily thirsty, but I was absolutely dripping and it seemed like the smartest idea. The water stops were well stocked and well manned, with amazing volunteers. I started taking my Honey Stingers at about mile seven. My in-race nutrition was doing great. We had one last cloverleaf, which was probably the most difficult. It was a downhill, and I was hoping to get some extra momentum, but because of the banking, it was actually kind of tough to run. Not exactly the way I wanted to return to Hollywood Studios, but I kept at it, and then we could see the toll booth, illuminated with eerie green lights and guarded by Malificent, high on the overpass, “welcoming” us back. A sharp left brought us into Hollywood Studios, back by Lights, Motor, Action. I got my last few sips of PowerAde, and took some deep breaths for the last mile of this run. The course through the park was somewhat twisty and turny, and I’m still not sure of exactly how we went. There was a stretch through the Streets of New York, and at one point, I recognized the windows of the costume department from The Great Movie Ride, but I was all turned around and backwards. There were volunteers and spectators all along the route, cheering us on, promising that we were almost done. It was kind of hard listening to them count down the miles (or tenths of miles, as it were), but the finish line was just getting closer and closer. I turned that corner and absolutely sprinted across the finish line. I stumbled through the finisher’s chute. It felt almost eternal. First, we got Chill Towels, with which I wiped down. Next, our medals. Then we hit up the tables for water, PowerAde, a snack box and bananas. After that was the medical area (Which was packed. The heat definitely got to some people, and I found myself hoping everyone was all right). And then pictures at the step and repeat. And then I was dumped out on Sunset Boulevard, and Mr PugRunner came over and got me. With a freezing cold can of Bud Light. For some reason, I kept listing to the left. I don’t know if my balance was off or what, but I couldn’t seem to hold myself upright or walk a straight line. Nothing really hurt, except for the second toe on my right foot, and I desperately wanted to get my sneakers off. We found a restroom and I’m embarrassed to say that it took me quite a while to change. I may have gotten stuck in my sports bra. What can you do? But finally, I was freshened up and in dry clothes and ready to enjoy the park and the Villains’ Bash a little bit. Beer with Mr PugRunner – the best post-race drink. To be honest, we were all pretty exhausted. And of course, the boys, oblivious to the fact that it was after midnight and it would be several hours before we got to bed, would be up early and raring to go. So Mr AMOTR and I basked in our accomplishment. Showing off our ToT medals! They glow in the dark. So fancy. Chatted with friends, and K showed me the sign she had made that I never got to see at the finish line. We thought about going on some rides, but my stomach wasn’t quite right and so we decided to just take a little walk around the park and then head to the shuttles to get back to the hotel. I was a little hungry, but what I really wanted was a long, hot shower, and the comfort of a nice, clean bed. I do kind of regret not figuring out where some of the characters were located for pictures, but the thought of waiting in line wasn’t all that appealing. I can always get tickets to Mickey’s Not So Scary Halloween Party at a later date and catch them then. I definitely didn’t lose any sleep over it and it most certainly did not detract from the excitement of the night. All in all, I loved it. I know a lot of people don’t love the course and the fact that it doesn’t go through any other parks, but I really didn’t mind. I thought there was sufficient entertainment along the way in the form of music and characters (and from the other racers) and it wasn’t quite as dull to me as I thought it might be. It was hard running on all the different terrains: grass, asphalt, gravel, sand and track. I’m not used to it and I’m not sure how to train for that kind of variety in the future. Everything went well. I did have that small issue with my toe, but it wasn’t anything major. I think I must have cut the toenail badly and I’ll just have to keep an eye on that for the next big run. I do think I need to do a better job at race-day nutrition, but my appetite was all over the place. Nothing really sounded or smelled good and so it led to some wonky eating. Nothing new or crazy, but just things that I wouldn’t have thought to eat on a race day. Night races are challenging that way, and it’s a good thing I don’t run too many of them. The organization and the volunteers were amazing. I was so impressed with how smoothly everything seemed to move, especially for the sheer quantity of people. Well worth the cost of registration, in my eyes. And there were just so many volunteers, being so awesome and interacting so wonderfully with the runners. I have so much appreciation for the hours they put in, and I am looking forward to volunteering at some races soon, to pay it forward. Most of all, I loved meeting new friends and catching up with old ones. I was so grateful for all the positive encouragement from everyone who was there, and I’m glad we had each other for support. I couldn’t have asked for a better first big race experience. 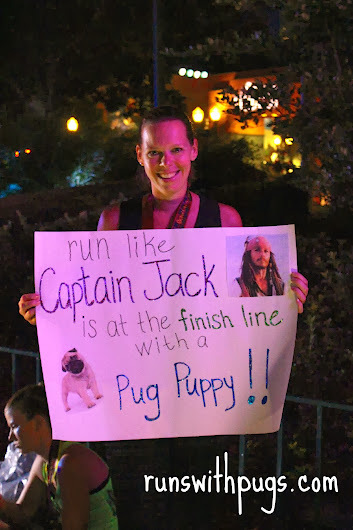 Well, it would have been awesome if Captain Jack Sparrow was standing at the end with a pug puppy for me. Dream big or go home, right? Did you run Tower of Terror this year? What did you think? * Not to worry – I have some actual running photos and will be able to share them in the next few days. Can’t wait to show them off! Oh, I have big plans. BIG plans! Way to go Jenn! I’m uber proud of you. Loved watching you cross the finish line strong. Thanks, TK! You were such an inspiration - running a half that morning and then coming down for another 10 miles! You're so amazing! I am so happy to read about this.. now I just need to convince my hubby to get to disney for a run! we love disney and everything about it! Congrats on a great training time… don’t forget the journey that lead you to this place! and I too can’t wait to hear about the big plan! It was such a great experience! I think you should totally drag him on down! So proud of you!! I wish you guys were running Wine & Dine with us!! Me, too! But, there’s always next year! And there are lots of other races coming! <3 <3 <3 Thank you for everything! Congrats on finishing the race!! I’m super jealous that you got to do it this year. Maybe next year for me! We’ll see. That’s really fun that they had all the characters on the route for people to see and get pics with. Must have been really motivating! I know that others disagreed, but I thought it was a great course. There was so much entertainment and it was so cool. Diana recently posted…T Minus How Many?? Right? I mean, the pug puppy would be HUGE, but Cap’n Jack is my favorite. GREAT work!! All that training was worth it! Thank you, Mer! The night races make it hard, especially when they are so late and when you have to spend so much time in the staging area. You’re going to do great, though! Just practice some late night running and do what feels best for your body! You’ll be amazing! It was so great meeting you 🙂 Hopefully we can spend more than just a few minutes together next time! I’m so glad to hear that your race went well! I’m also jealous of your beer… Kel and I didn’t have any because we both felt like beer did not sound appealing at the end of the race. I don’t know what got into me..because I love drinking all the beers! We definitely have to plan something for the future! So glad we got to meet! Congrats on your first big race!!! I love Disney races. They are so fun and full of entertainment. I especially like the plethora of resources available during the actual race. But they are definitely SUPER CROWDED! Glad to hear you enjoyed yourself. This is definitely a race I’d like to do next year. I loved the access to water/powerade, restrooms, aid, etc. It was crowded, but I really felt like it was managed well. I hope you get to do it! Oh my gosh! Reading this brought back so many memories of my first half marathon at Wine and Dine in 2011. There was so much similarity: getting there super early, not knowing what to expect, feeling the same feelings on the run, not being able to ride the rides at the finish line, etc. Awesome job!! Huge congratualtions!! Okay, now, I forgot. What’s your next race? I think I remember you’re training for a half. What is it? Next up is a Color Me Rad, a local 10K, and then I'll be running the Space Coast Half. I'm aiming for one or two races a month. Thank you! I hope you get to that one! Congratulations! This was so fun to read! I have some friends that ran a Disney race and hated it, so it was nice to hear a postive take on one. Also, love the sign! Thanks, Jina! I can understand how some people would be really put off by the massive size and subsequent crowding of the runDisney events, but I thought it was great. Not to do all the time, but definitely a good experience. The sun ruled. I have wonderful friends. Maria @ Lil Mys Ninja recently posted…I’m going Barefoot4Them, are you? I hope so! Time to get back to work! Yay congrats!! Glad you had such a good race! I have never run a night time race and this one looks so fun. Congrats on crossing that finish line. This was my second night race. They are tough, but this one was well worth it! Great job!!! I would be so freaked if they played The Twilight Zone theme before a race…EEEK!!! Sounds like you a blast!!! Congrats lady!!! You have worked your booty off for this race, and I am so, so happy it was so rockin! I agree that night race nutrition is tricky, I have no idea how I would prepare for one! How cool that you got to see so many other bloggers in real life! Thanks, girl! It was a challenge, but I’m done with nights for a while. Way to go! Congrats on the race. Sounds like a fin time!! Yay! Congrats on your big race! I’m glad you had such a great time! 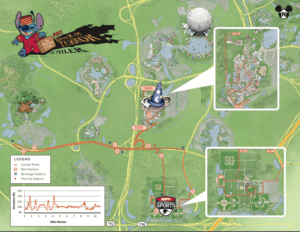 I’m officially addicted to Disney races…its sickening 🙂 But I’m coming up to Jax on Sunday for the Pumpkin 10 miler. I don’t think I’m going to do as well as I wanted since I’m injured but I’ll take what I can get! Oooh! I hope I get to meet you! I’m not running but I think I’m going to go out there for support for K! Congrats on a great race and terrific recap! I love the poster your friend had waiting for you… awesome!!! Thank you! Kristin is the best!